LONDON, England (CNN) -- The 2005 London bombings on three subway trains and a bus, which killed 52 people, could not have been prevented, according to an official report into the attacks released Tuesday. 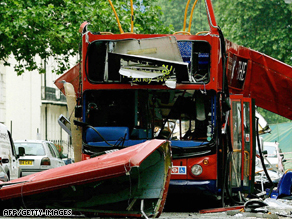 The wreck of a bus destroyed by a bomb in central London on July 7, 2005. Police and intelligence services did all they could to trace suspects and avert attacks given the resources, intelligence and evidence they had at the time, said the report by the Intelligence and Security Committee, which reports directly to the prime minister. "It is a very shocking fact, and it's one we have to live with," said Kim Howells, a lawmaker who chairs the committee. Some 700 people were wounded in the bombings on July 7, 2005. All four bombers died in the blasts. But the report released Tuesday said it would have been impossible to trace every person connected to the plot. "If you want complete coverage, you're going to have to have hundreds of thousands -- literally -- of security and intelligence officers, and that's not the society we live in," Howells said at a news conference. "I'm afraid that it is an extremely uncomfortable fact." Law enforcement agencies could not have simply shifted resources to cover areas that needed attention, the committee said, because other operations were deemed more urgent at the time and officers had to make "hard choices" about the suspects and leads it wanted to pursue. "Hindsight is a wonderful thing," said committee member Michael Mates. "Having gone into all the details, we can't find any reason to criticize the judgment they took at that time." He added, "I wish we could say it won't happen again, but we can't." Resources are only part of the problem, the committee said. "It is not simply a case of 'throwing money at the problem' -- MI5 operates under legal constraints, too," the report said. MI5 is Britain's domestic intelligence agency. "MI5 must have good reason to investigate an individual before they are permitted to use intrusive techniques -- the law is designed to protect an individual's right to privacy." Under the law, there was no reason for police to have followed some of the people now deemed to have been involved in the attacks. Surveillance or further investigation simply wasn't justified in the months before the attacks, said committee member George Howarth. "With hindsight, we are now able to consider past events, connect them and understand what might have been happening. But this is only with the benefit of hindsight," the report said. Police coverage is now better than it was, Mates said, and he praised the British government for spending more on law enforcement and the security agencies for recruiting more staff. The committee did, however, criticize the communication between police and security services, just as the previous report did. It also criticized the record-keeping of MI5. It is the panel's most comprehensive report yet into the 2005 attacks. The committee looked at every detail that police and intelligence agents knew, including recordings, photographs, and records. It aimed to deliver a more complete report than the one issued in 2006, Howells said. The final result took more than 14 months to produce and ran to more than 100 pages. "We appreciate that everyone wants to be reassured that there will never be another 7/7. Such an absolute assurance cannot be given," the report says. "What our agencies can do is to build an intelligence network that gives them as much information as possible and then try and stop those that it comes across -- which is what they have been doing. But we must be realistic. Despite the increased efforts of the agencies, and the increased resources at their disposal, the odds are stacked against them."